Struggling to add momentum to their campaigns leading up to the April 13 general election, political parties canvassed key swing constituencies over the weekend, posing as troubleshooters for the people’s economic hardships. The ruling conservative Saenuri Party stepped up its aggression against the opposition camp for holding back the nation’s economy by deterring a series of economic revitalization and labor reform bills. The Minjoo Party of Korea urged voters to “pass judgement on” the Park Geun-hye administration’s economic failures, blaming the conservative side for deepening the nation’s social and economic inequality. 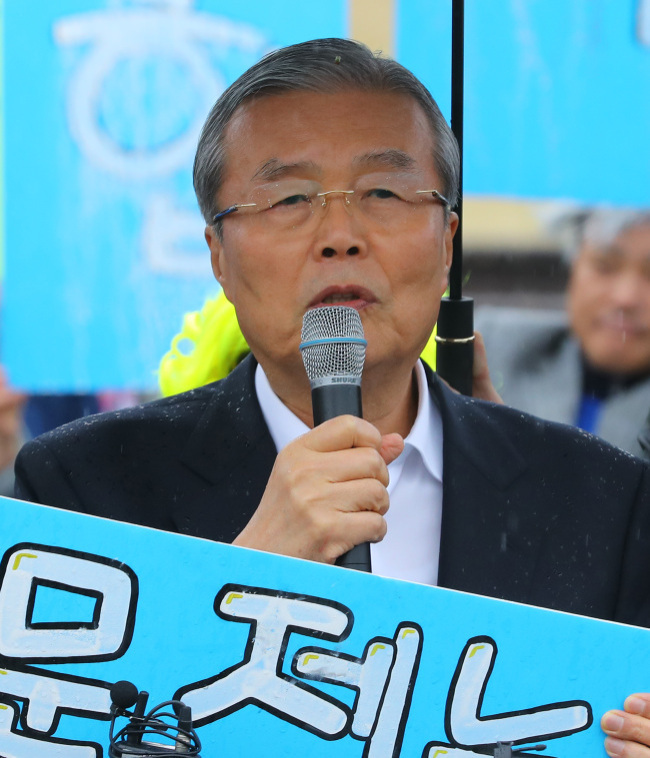 “Our goal is to create jobs for the people, but it is the Minjoo Party that has been standing against the idea,” Saenuri chief Rep. Kim Moo-sung repeated on Saturday while canvassing the metropolitan city of Incheon in support of the party’s candidates. Incheon, with 13 constituencies and a considerable pool of undecided swing voters, is considered a highly strategic campaign field both for the ruling and opposition parties. Also, due to its high density of manufacturing industrial complexes and distribution centers, the western seaport city is sensitive to the change in economic policies. “The Minjoo Party seems to think that by obstructing every action of the Park Geun-hye administration, they may rise to power in the next presidential election,” Kim said, while stumping for fifth-termer and former Education Minister Rep. Hwang Woo-yea. In a matching move, the party’s election committee chief and former Finance Minister Kang Bong-kyun on Sunday released new economic policies, including a plan to pull up the legal minimum wage to 8,000 won ($6.90) or more from the current 6,030 won over the next four years. “Distribution measures, such as an increase in corporate tax, not only have limited impact but may also weaken the nation’s industrial competitiveness in the long-term,” Kang said. This was a direct attack against the economic democratization platform led by the Minjoo chief Kim Chong-in. In retaliation, the Minjoo Party reiterated its call to judge the Park administration for the nation’s economic difficulties. “It is the Saenuri administration that is liable for our economic reality today,” said party chief Kim Chong-in while campaigning in Gwangju and the Jeolla provinces on Saturday. The ruling party leadership has been largely confident of winning at least 180 seats -- that will allow the party to pass contentious bills without the consent of the opposition. The Gwangju and Jeolla regions -- referred to as the Honam area -- have long been a stronghold for the Minjoo Party and its former incarnations. But due to the defections of several lawmakers who joined the new centrist People’s Party led by Rep. Ahn Cheol-soo, the main opposition is expecting a hard battle this year. 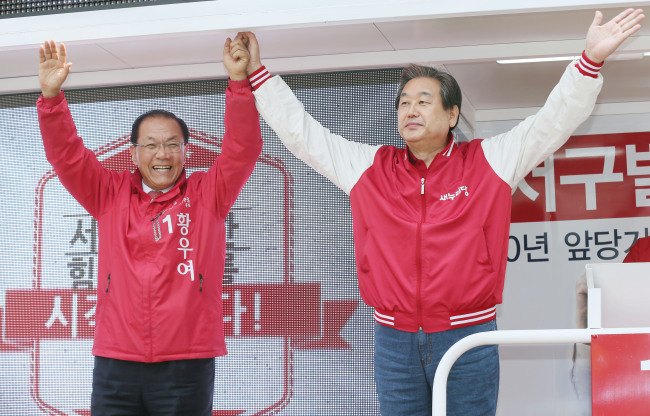 “We have successfully placed economic issues at the top of the election agenda,” said Minjoo Party spokesperson Kim Sung-soo. The People’s Party, on the other hand, chose to stay away from the economic frame and to criticize the conventional political circles, in an aim to whip up swing votes. “People who have been disappointed over the incompetence of the National Assembly over the past four years are ready to judge both leading parties,” said spokesperson Kim Jae-doo. Sim Sang-jeong of the left-wing Justice Party claimed that the top three parties, obsessed with their power struggle, had failed to suggest distinctive economic policies.